Officers with the National Police raided the offices of Nicaraguan news outlet Confidencial around midnight on Dec. 13, taking computer equipment and documents with them, according to reports from the publication. The raided building houses the newsroom of the weekly magazine, the digital newspaper and television programs Esta Semana and Esta Noche. Carlos Fernando Chamorro, editor of Confidencial, blamed the regime of President Daniel Ortega. According to Confidencial, the raid --which it classifies as illegal-- happened in the context of the National Assembly blocking nine NGOs from operating in the country. Five of those organizations were blocked just on Dec. 13. One included the Center for Communication Investigations (Cinco, for its acronym in Spanish), which was raided at the Confidencial address in 2008, according to the publication. The media companies behind Esta Semana, Esta Noche, Confidencial and Niú are not related to Cinco in any way, it added. The offices of the Nicaraguan Center for Human Rights were also raided on the night of Dec. 13, according to El País. Chamorro said they will take the case to the Supreme Court. “Once we have the documentation of the complete inventory (of the goods that were stolen), we are going to file a writ of amparo summoning the Supreme Court and the authorities to protect our rights, property rights, rights of press freedom and the rights of freedom of expression that have been crushed by a dictatorial act of Daniel Ortega,” Chamorro said in the video. On Dec. 14, Special Rapporteurs Edison Lanza (IACHR) and David Kaye (UN) condemned attacks against independent media and journalists in Nicaragua. “The situation faced by journalists and executives of media like La Prensa, Confidencial, 100% Noticias, Radio Darío, Radio Mi Voz, Canal 12 and the journalistic team of Canal 10 of Nicaragua, among others, victims of constant harassment and threats, is serious,” said Lanza, Special Rapporteur for Freedom of Expression. 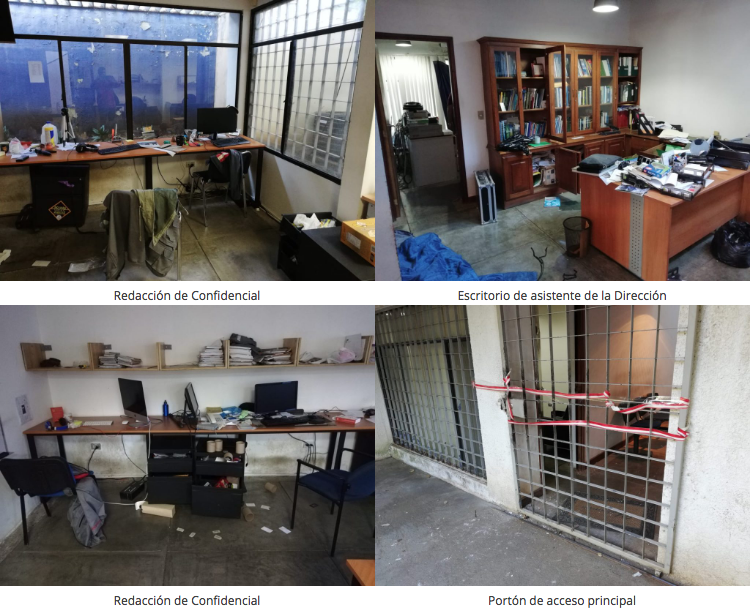 The release from the IACHR specifically named the raid on the Confidencial offices. * César López Linares assisted with this report.